I am posting parts of this email from a blog reader and this is not the first time i heard of such story. The experience is not confined to our senior friends out there, but also to some middle age guys who had once tasted the old Spanish version of pandesal probably from their lolos who were once bakers or from "panaderias" who still cling to the old style of baking breads. The most common denominator? The pandesal should be crispy and slightly toasted outside, light but slightly chewy inside, a bit salty and not sweet, not creamy yellow in color and the "piece de resistance", that aftertaste once you chew on and swallow the bread. The flavor clings to the throat and top of your mouth cavity, slightly yeasty and indescribable really since this flavor is not artificial but is derived from the long hours those pandesal lovingly sit on the pans to proof. Yeast i suppose is not in abundance in those days, they probably use fresh compressed yeast and rely heavily on the fermentation process to get that extra kick when they bake the breads. So when the yeast is low, the proofing time will normally take longer and this is what builds the flavor in the bread. The pandesal sold in those days, and i am taking myself on a time warp here since i was not born in the 50's, might not contain butter and eggs, and most likely no milk at all. Only the rich can afford these ingredients and since pandesal is "pang-masa", the only luxury it has is the time the bakers spent making them. 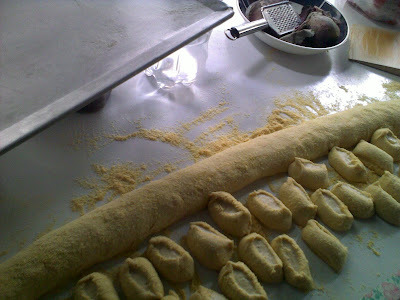 I don't just mean the way it was kneaded which we all know was "mano-mano", no, not the sweat those are real salt, and a bit of lard. Lard is rendered beef fat, not the lard sold in bakery supply stores nowadays. It is funny because i think these bakers have passed down this term over the years and have not differentiated lard from shortening or did not bother to ask. So when you buy shortening in these local suppliers, they tell you they do not have shortening they have lard, or when you ask for lard they tell you they have shortening. To them, it is the same thing. Times changed and with the arrival of the Americans, the tub shortening and margarine were put into use, no more rendering of fat, sugar is available everywhere so why not put more sugar in the bread? The pandesal started transforming from the salty version to the more upscale, more elitish "sosyal" style, yellow food coloring is in demand so they can lower the cost and yet make their breads look like they have eggs or butter. Even the pandesal Baliwag which i thought of before as an eggy version but miniature in size do not contain butter at all, but lard! Yes, it has eggs, it is slightly salty but no margarine and butter, although the color speaks bright yellow to me. This email reminds me to inquire about how to get some pandesal to my aunt in California. She told me that my cousin missed it too. I am thinking, why don't i form a Pandesal Club, for Filipinos out there, you know send them Pandesal once a month (of course for a cost ) but it will be more of a box full of memories, than a business proposition since i cannot bake on a regular basis due to my previous operation. Hmmm. Why not? I will think about it. I hope, my email response helps you Sir, and if you live somewhere near Sacramento CA, i might visit my aunt sometime this year, i will make sure that you get that Pandesal you crave for. I am a pinoy living in the U.S. I left the Philippines a very long time ago and I have a longing about pandesal. I remember as a teenager in the late 50s some friends and I would to go to the local bakery at dawn and buy pandesal fresh from the oven. We would go home and eat them using carne norte or tome sardines as palaman. 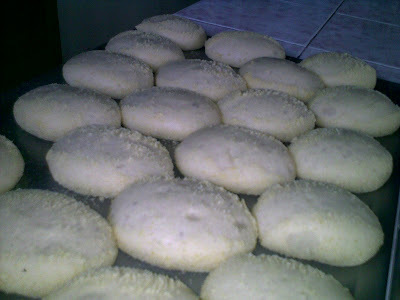 The pandesal would be warm and soft inside but crunchy/chewy outside. Sarap. That is my longing. Because in the U.S. I cannot find the same kind of pandesal. 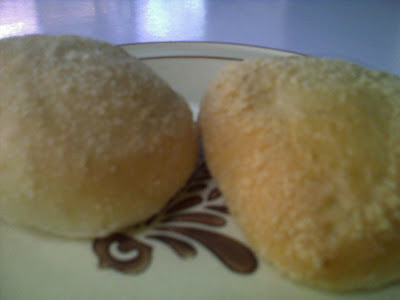 Even the ones sold in Asian stores marked Filipino Pandesal are different - they are soft and light and no different from the usual American dinner rolls. I do a bit of cooking for my family and I know how to make the dinner rolls mentioned above. But I have tried all kinds of recipes and spent months tweaking and experimenting but I have never gotten the same experience as the one embedded in my memories. It is painful just thinking about this.